The article defines the peculiarities of influence of temperature regimes on both lubri-coolant removal from iron chips and conditions of their briquetting with the presence of residual amount of lubricoolant. Rate of lubricoolant removal from briquetted iron chips in the temperature range of 300... 1000°C has been studied. Heat treatment of briquettes at 800...1000°C resulted in lowering lubricoolant content in iron chips down to 0.3%. Key words: iron chips, lubricoolant, heat treatment, heating time, density. 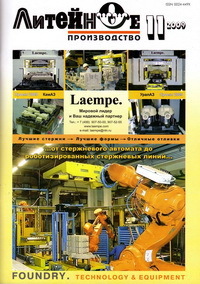 The issue of computer preproduction in foundry with use of CAD/CAE/CAM software is viewed; the problems of cast simulation and ensuring high quality of castings at the stage of technological processes design are discussed; the experience of cast technologies enhancement is performed for large dimension thick-walled steel castings to decrease its reject limit in hot cracking. Keywords: CAD/CAE/CAM, simulation, gravity cast, large dimension thick-walled steel castings, cast defects. The process of dust and gas formation during melting and refining of silumins in the re-verberatory electric furnace SAN-2,5 has been investigated. It has been found that the highest dust and gas content in the furnace and exhaust flue is observed during refining treatment with zinc chloride. The intensity of dust and chlorides evolution is described with parabolic dependence on the time after introducing the refining preparation into the melt. Dispersion, X-ray structural and electronic microscopic analyses of forming dust have been carried out. Key words: harmful emissions, dustiness, refining, chlorides, dispersion, X-ray structural analysis. Experience of introducing a modern sand preparation complex with the possibility of making clay-bonded sand molds on AML and jolt molding machines with uniform molding sand parameters in the future is set forth.